2. Place the pasta in the water and cook for 7-9 minutes, or according to the packet instructions, until al dente. Drain, reserving a little of the cooking water. 3. While the pasta is cooking, heat the oil in a large frying pan. Add the garlic and chilli and fry for 2-3 minutes until soft. 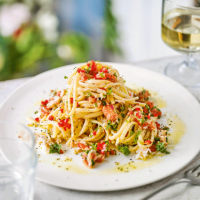 Add the tomatoes, fry for a further minute then stir in all the crabmeat, parsley, lemon zest and juice. 4. Add the drained pasta to the pan with a spoonful of the reserved cooking water and toss to combine. Season to taste and serve.